Used 3 phase 10Kw Grid Inverter. All working fine when removed, no technical issues. Keep on the right side with the Fronius IG Plus 120 V-3 – in terms of yield, grid management and requirements that may be imposed by power supply companies. Decide on site whether it is desirable or necessary to ground modules. Insert fuse and enable software – ready for grounding. All Fronius IG Plus devices have a rugged, elegant metal housing. They are UV-resistant and have corrosion protection, making them suitable for use both indoors and outdoors. No additional installation work or cabling is necessary. Extremely convenient and highest levels of safety according to DIN-VDE 0100-712. 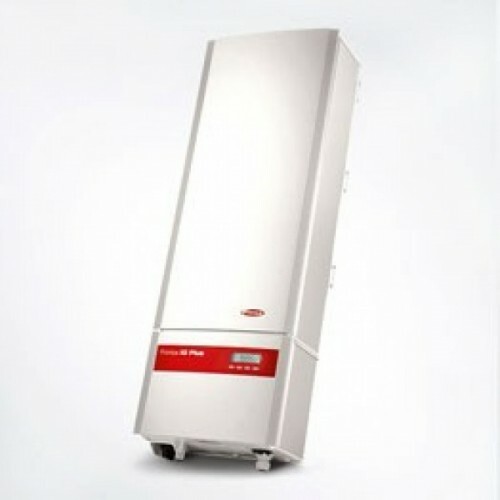 Up to 6 strings can be directly connected to all Fronius IG Plus inverters. The integrated holders for string fuses allow the module strings to be disconnected from one another depending on the module manufacturer’s requirements. The cleverly-devised combination of several power modules means Fronius inverters always achieve maximum yield, even when in the partial-load range. This is all down to the unique Fronius Master Inverter X-Change system (MIX), a development of the classic master/slave principle. How it works: all power modules are equal. The „master“ is allocated alternately, taking into account the operating hours worked. The result is that loads are applied evenly to individual power modules and the operating time decreases.